Lady Henrietta Martha Hamilton (1780–1857) was born in Stanmore, Middlesex, England, and was the wife of Sir Charles Hamilton, Governor of Newfoundland. She is best known for her miniature portrait entitled Mary March. 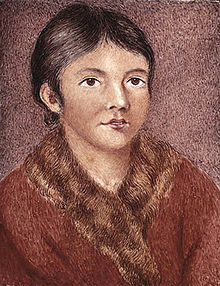 The painting is a watercolour on ivory of an aboriginal Beothuk Demasduit, and is considered by many to be the only representation of an aboriginal Beothuk taken from life. It was painted in 1819 at St. John's where she lived with her husband during his term as governor from 1818-1824. In the fall of 1818, a small group of Beothuks had taken a boat and some fishing equipment at the mouth of the Exploits River. Lady Hamilton's husband, Governor Hamilton, had authorized an attempt to recover the stolen property. On March 1, 1819, John Peyton Jr. and eight, armed men went up the Exploits River to Red Indian Lake in search of Beothuks and their equipment. A dozen Beothuk fled the campsite, Demasduit among them. Bogged down in the snow, she exposed her breasts, as she was a nursing mother, and begged for mercy. Demasduit was captured; Nonosbawsut, her husband and the leader of the group, was killed while attempting to prevent her capture. Her infant son died a few days after she was taken. Demasduit was called Mary March because she was captured on a bitter March day. Peyton and his men were absolved of their murder by a grand jury in St. John's. The painting resides in the Portrait Gallery of Canada in Ottawa. Her other well-known work is "Woodlands Cottage". She painted mostly using watercolors. Hamilton died in London, England, in 1857. ^ a b c d "Canadian Women Artists History Initiative : Artist Database : Artists : HAMILTON, Lady Henrietta". cwahi.concordia.ca. Retrieved 2017-03-30. This page was last edited on 7 November 2018, at 11:09 (UTC).